Hello all. I was looking through my models folder a few days ago and saw this sword sitting half finished and I first thought to myself: That looks like something out of a Robert E. Howard story or something. Then I thought to myself That would make an interesting Poser Prop. After putting a few finishing touches on the sword and mapping it, I made it into a prop. Thus the Primordial Blade was born. 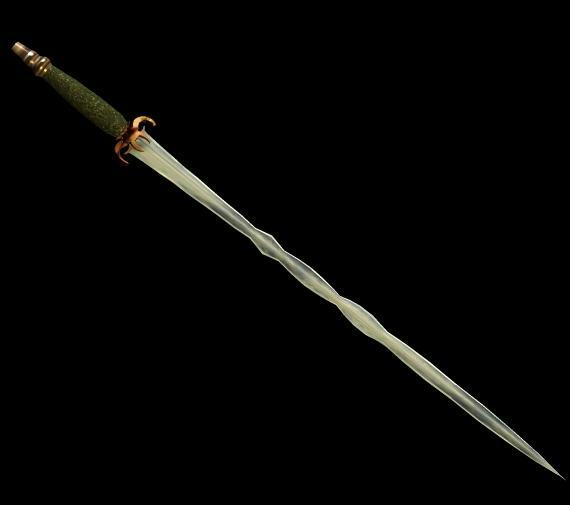 A sword that perhaps would have been wielded by a warrior in the dim mists of prehistorical time. Perhaps by the Serpent Men of Valusia. The blade is made of a metal unknown to modern man (Lagh Metal?) and the leather of the handle is made from the hide of a beast which no longer walks the world. The Guard and pommel are made of fiery Orichalcum. The Primordial Blade is a simple prop and it is supplied complete with all needed textures. It is pre scaled to the hand size of M4 and two versions are included: One global prop with no parenting and one smart propped to M4's Left hand. There is also a hand pose included for M4. The weapon includes some reflection and displacement so raytracing and displacement should be turned on for full effect. The prop renders quickly. Enjoy! **Disclaimer** I must ask end users of my content that they please not upload any of it in part or in whole (Including meshes, wireframes, textures, etc.) To Second Life or to any site owned or operated by Linden Labs Inc. Normally I do not mind my content being redistributed with certain conditions but; as stated by Linden L abs Incorporated's Terms of Service Agreement, per section 7.3 : prepare derivative works of,display, and perform the content solely for the purpose of providing and promoting the service". Archeopterix (3 years ago) Inappropriate? Thank you! May it guard you well. MagicWeaver (3 years ago) Inappropriate? And of course you're welcome! Keep it sharp! Thank you! I appreciate your approval. Hope you enjoy it! Thank you. It makes me happy to share my work with people who enjoy it. Ogede (8 years ago) Inappropriate? impressed by your work. I love it! Thank you. Please enjoy using it. Valentin3D (8 years ago) Inappropriate? Thank you. Its my pleasure to be of assistance. detail on this is kewl, like the criss in the middle, looks very realistic.